I have not been feeling very well so have been quiet. I am hoping to go back to work today for part of the day and then I have a doctor's appointment, and a couple more doctor's appointments next week. Hopefully I will be feeling more myself soon. I hope you like this drawing, It's on Etsy too. I used pitt pens, the "s" size and the brush pens. 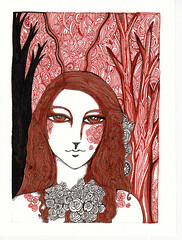 the drawing is 5 x 7"
this is another one of my pins i made using a ceramic face from earthenwood studio. i am working on some more! 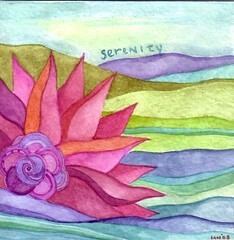 i hope the headache that is fighting me will settle down so i can get some good beading and painting time in tonight. i finished the audio book i was listening to, The Poisonwood Bible by Barbara Kingsolver. I've read the book but it had been a while - such an amazing book. I am not sure what to listen to next. I checked and the selection of audio books available by Isabel Allende and Gabriel Garcia Marquez is pretty slim. I sort of feel like magical realism - but I am open to other suggestions if you have any! i have been doing some research on Palissy Ware. This is a form of ceramic done in a style popularized in the 17th century, though it had a revivial in the 19th century, and many intact examples are from that period. 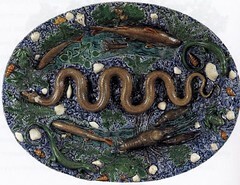 The originator of the style was Bernard Palissy, who was born in the 1500s. Palissy Ware is used to descrive other works in this style though, some by other known artists and some anonymously done. To create these work very realistic life sized molds were made of animals - mostly sea creatures but also reptiles and frogs and things- and they were glazed to be very life-like. they are kind of creepy and kind of cool. very high relief so i can't imagine they would have been used as actual serving ware, but more as decoration. i imagine a lot of people have never heard of this type of ceramic so I thought I would share. Just BE if I can remember how. i feel like i could use a recharge. i am not sure what one does anymore when one needs one of those. i am not sure our culture is set up to accommodate that or even recognize the need or reality. it came up in a meeting at work but that got me thinking about it more, as i have often lately. how hard it is to "unplug" - how unexpected it seems that anyone would want to, etc. i mean there are people who purposely take vacations in places with no cell coverage because 1) it's the only way their employers will leave them in peace and/or 2) it's the only way they themselves can disengage. i suppose there was a time when having a quiet moment might mean taking a walk on your lunch break or sitting quietly listening to a record or something. well those days are long gone and now, while on your walk, you probably are surfing the web on your "phone" while listening to your mp3 player, maybe taking a few calls and sending out some texts, then updating your status on facebook and tweeting what you had for breakfast. where is the unplugging in that? and it's hard anyway because it seems that connection is addictive. maybe it's addictive because it's ultimately not usually fulfilling. i mean it does not really satisfy a longing for companionship does it - there are exceptions. i do have some friends on line who i email regularly much in the way they i used to send letters. but honestly does playing farmville feed your SOUL? so that is the problem, or part of it, what's the solution? that's a lot harder to come up with. i have to think about that. and right now i am trying to decide what is calling me this evening - beading or painting? i hope to do some art, maybe listen to an audio book (because i find that more relaxing and rewarding that most tv) and just BE. if i can remember how. i am awake in the wee small hours and i am sure i am going to regret this later. however i decided to be productive, rather than just lying in bed fretting about the things i need to do. so i did the dishes, paid bills, and listed 2 new necklaces on etsy. this one is my favorite - so far! 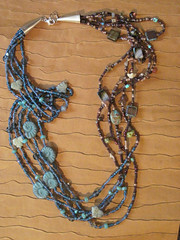 i love blue and brown together, and this necklace is almost like 2 in one, two parts each with a distinct voice. Hm, I am a twin - could there be a connection there? what i just said might only make sense at 5:50 AM. Anyhow, I was under the weather for a few days but am trying to get back into the art-swing-of-things. The C21 recommendation will be formally delivered by Seattle Center Director, Robert Nellams, to Mayor Mike McGinn this week who will then make his recommendation to the Seattle City Council for final approval. The Mayor has said he will side with public opinion. Now is the time to make your opinion count. If you believe in this project and want to take an active roll you can make a difference. Call the Mayor's office today at 206-684-4000. To maximize the impact of your call, please give them your name and let them know you support the Chihuly project at Seattle Center. After calling, emphasize your support by emailing the Mayor and City Council. send an email to Chihuly Studio and let us know that you are willing to add your name to a list of Chihuly project supporters that will be presented to the Mayor and Seattle City Council on Friday September 25th. this is the autumn i would like - but i think i would have to move to new england. so far what we have is rain and a few leaves the color of brown paper bags. but. i am not stopping painting. Since fall is descending (at least in Seattle descending is the right word, rain in the forecast) I wanted to share this link again, which I think I did last year and the year before, but I like it that much! 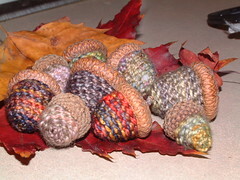 these little acorns are so easy to make following the tutorial at Resurrection Fern! 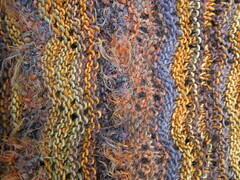 I used koigu sock yarn here. great for using up leftover yarn! it's funny that i use so much color in my artwork, because in my every day life i mostly wear brown and black and grey. though i do have some colorful jewelry and knitted items! 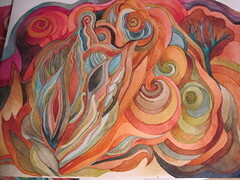 this is a painting i did a couple years ago. i love combining cool colors with warm colors, and here i did that mostly by going towards fuchsia and orange - red would have been too much for my faint heart! maybe too much like christmas - i don't know but red is the trickiest color for me to work with. 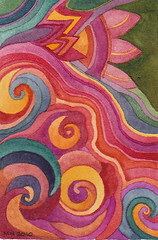 just looking at this painting makes me want to go paint, but i have to get ready for my "real" job. "Colour helps to express light, not the physical phenomenon, but the only light that really exists, that in the artist's brain." i listed 2 more pairs of bead embroidered earrings on Etsy. "Everything you can imagine is real. " 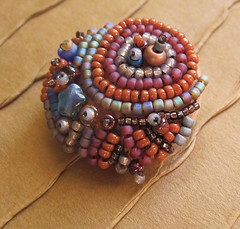 also, i've started listing some beaded items on Etsy. i used to bead a lot. like probably at least 20 hours a week on top of working full time. 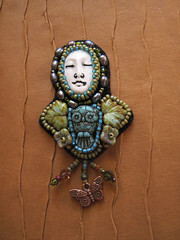 i also wrote for bead magazines, had my beadwork published in books and magazines, and taught bead embroidery classes. now, just shy of 40, it takes me 20 tries to thread a needle i could easily thread a year ago. I need to go to the eye doctor. I am still beading, but not as much as I was, and I try to use mostly size 11 and larger beads, I use a few 15s, but it is too hard on my eyes to use anything smaller than that. But let's hear it for keeping on beading! Here is a little something I was working on over the weekend - and more to come! 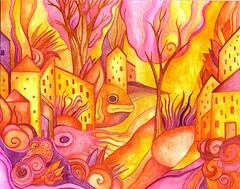 The backdrop is a bit of a watercolor painting, also in progress. The face cabychon here was made by Melanie at Earthenwood Studio. 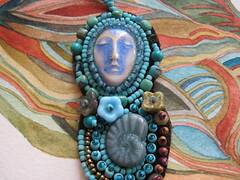 Many of my favorite beaded items feature her wonderful beads! I could play with color all day. 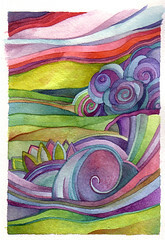 this is another recent little painting, less autumn-y colors than i have been using. 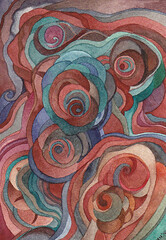 For some reason Red is the hardest color for me to work with, This piece does include a lot of orange and magenta, though I don't know how well it shows up on your monitor, and those colors are easier for me to work with. A lot of people have looked at this image during browsing. I am curious what gets their attention. Is it the contrast in colors? the bright colors? The composition? Or maybe they just look at the thumbnail and say "what IS that?" and so they click for a larger view. One can never tell. I feel like I should be using more orange - my autumnal stuff lately has been more brown and amber and not as much orange. I am sort of thinking of orange and green. And orange and slate blue. We'll see where that ends up going. I could play with color all day. 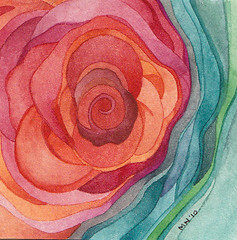 Sunset Rose is on Etsy. autumn is a time for nesting, for gathering together nuts and cookies and mugs of tea, for lining my sofa nest with balls of yarn and "fat quarters" (quarter yards of fabric cut to be 18x18" for you non-quiters). of course, so far in the northwest, not many leaves have turned color and fallen, but the rains have come and they seem to be here to say for a bit as far as the weathermen know. 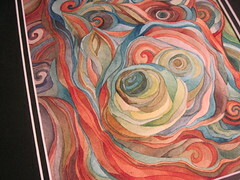 so i just want to sit and knit and bead and paint and draw, wrapped up in an afghan my grandmother crocheted. of course i seem to have some responsibilities in the real world that i can't shirk, but i can at least dream, can't i? i need to check my scanner settings. of course this is going to look different on every monitor anyway, but generally i think things look a bit more vibrant in person, then once they get uploaded to certain sites, such as etsy, they seem to get a bit more washed out. you know how there are some watercolors that are just a bit, well, anemic? you want to sit them down with a nice spinach salad? well, mine are some of those. mine sing. only sometimes only in person. i just wanted to clarify that! i think they have a little life of their own, they come through me, i am the vessel, and then i'm the archvist, left behind to try to present them in their best light. speaking of light, it's going to rain for the next 9 months or so and that the grey light does not help either. it was a good weekend. mostly quiet, which is how i like it. 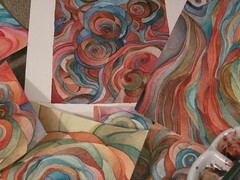 i did a lot of painting, watercolor. we watched 2 star trek movies and i watched some fringe. i read a lot - finished Middlesex by Jeffrey Eugenides, which won the pulitzer prize and was very good! I even managed to go some chores. I find myself just craving a block of solitude. I had 4 days off work but that was 3 months ago. I have some time off in November. Just need to hold out until then. 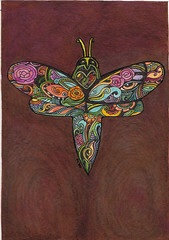 I listed 3 watercolors on etsy if you are interested. there will be more as this week unfolds. 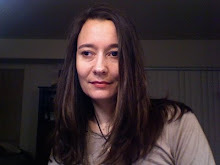 I posted the paragraphs below as a comment on Rice Freeman Zachery's Blog and she said I should spread the word so I decided to post it here too! you may not go home and paint a painting and get it in the louvre. but you can go home, paint, just do it, love it, and hang it on a coffeeshop. or share it online. or give it to someone who will love it. you may not be able to go home and write the next great american novel, but you can go home, write, love it, get it published, and write some more. every moment you paint, draw, make music, sew, write, etc etc is a moment in which you are living the life you love, and just because you may also have another job that you need to pay bills does not mean you are not also, in those moments, living the life you love the most. I love my town. Even when it rains for 6 months straight. I just hope it does not start doing that for another few weeks ! 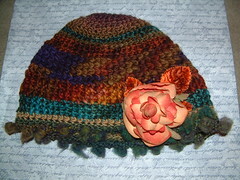 this is a hat that I knit last year, thinking I might sell it, but I decided I love it and kept it. 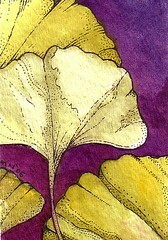 I post it now because I am thinking about fall colors, and it contains 2 on my mind; brown and purple. What colors do you think will be in for fall? I think: Brown, Purple, Olive, and Grey. I also think heathered-weave will be in. What colors are you drawn to? What colors do you like to see together? What colors did you used to hate but learned to love? What color is the hardest color for you to work with - for those of you who are artists?